How Much Do You Want To Pay For Accessories This Spring, 2010? Natural gemstones are all over the home shopping networks. Particularly hot is designer Deb Guyot adding extra sparkle with multi-faceted, chunking quartz and incorporating other precious materials like pearls into her designs. 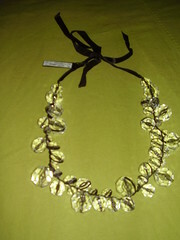 One hot item has been her quartz twisted necklace and bracelets. 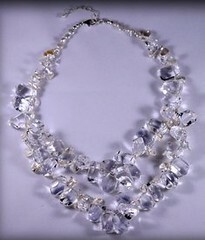 If you buy a designer original or from HSN expect to pay $200 +up and well worth it given the amount of gemstones. However if you just want the sparkle without the big tag price, MarkdownMom found a great substitute necklace chunky, mega sparkle in multi-faceted plastique colors offered onyx, blues/purples multi, or MarkdownMom’s personal favorite,clear, for $7! Instore at WalMart.